Gary, IN’s The Spaniels fit the mold of the early 1950s, all-male doo-wop group. The five-piece signed with local label Vee-Jay Records shortly after graduating from Roosevelt High School, joining a heavy-drinking blues man named Jimmy Reed as the first artists on the label’s roster. Vee-Jay would move to Chicago and grow into the largest black-owned record label prior to Motown, eventually becoming the first American label to sign an unknown British quartet called The Beatles. But, that’s a different story for a different day. Released in the spring of 1953, “Baby, It’s You” was just the second 45 from Vee-Jay. The track climbed to number 10 on Billboard’s R&B charts. In and of itself, the song is not necessarily anything to write home about. 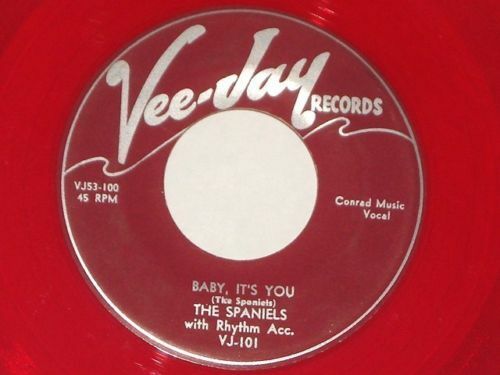 Its sparse instrumentation and pitch-perfect harmonies serve as a shining example of the quintessential doo-wop tune, but The Spaniels would go on to have much larger hits such as “Goodnite, Sweetheart, Goodnite.” Instead, “Baby It’s You” is noteworthy for its role as the earliest example of a problem that would plague Vee-Jay for the remainder of its existence – unexpected success. Vee-Jay was ill-equipped to handle the demand for a track like “Baby It’s You.” The label was forced to lease the record out to close friend and eventual Vee-Jay general manager Art Sheridan (then with Chance Records) to handle national distribution. This would become a recurring saga in the tale of Vee-Jay Records, and one that would eventually mean their undoing. Listen to where it all began below.